A loan of $2,325 helped a member to buy chickens and animal feed. 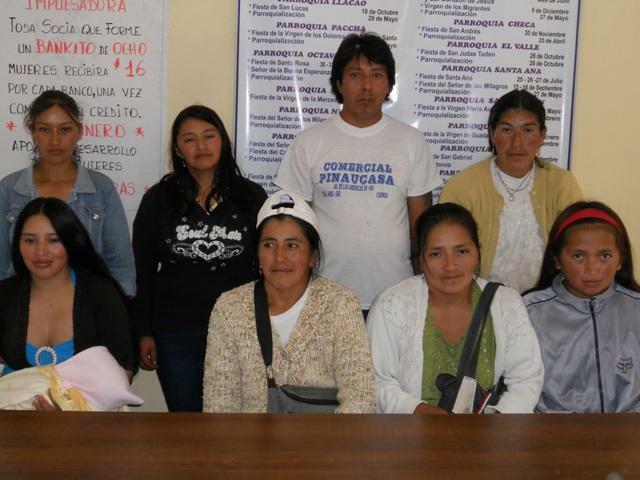 'La Propuesta' community bank is made up of seven women and one man, most of whom live in Tarqui parish, in Cuenca. This is a cold-climate area with vast plains which are ideal for livestock raising. The local people raise livestock and farm. Many also work in different business activities in the city. Our members are noted for keeping the flame of their culture and traditions alive. They are kind and very hard working. Through their efforts, they improve their households' finances so that they can get ahead in life together with their families. One of the members is Maida. This is the first loan that she has taken out through the community bank, which she was invited to join by a friend. She is 25 years old and lives with her common-law husband. The couple have a daughter who is one and a half months old. Maida's husband is a driver and provides a taxi service. They live in a rental house. Maida looks after her house and, at her mom's house, she raises pigs, guinea pigs and chickens which she sells to her friends and acquaintances. She will invest her first loan in buying chickens and feed for her animals. Her goal is to build her own home. El banco comunal La Propuesta está formada por 7 socias y 1 socio quienes en su mayor parte viven por la parroquia de Tarqui en Cuenca, este lugar es de clima frió, sus grandes llanuras son propicias para la ganadería, su gente se dedica a la cría de animales y a la agricultura, muchos laboran en la ciudad ejerciendo diferentes actividades. Nuestras socias se caracterizan por mantener la llama encendida de su cultura y tradiciones, son amables, gentiles y muy trabajadoras ya que con su esfuerzo mejoran la economía de sus hogares para adelante con sus familias. Una de las socias es la Señora. Maida, este es su primer crédito que realiza en la banca comunal al cual fue invitada por una amiga. Tiene 25 años, vive en unión libre y fruto de su unión ha concebido una niña de un mes y medio. Su esposo es de profesión chofer y presta su servicio con un taxi, la casa en la que vive es arrendada. La Señora. Maida se dedica a su hogar y en la casa de su mamá se dedica a la cría de cerdos, cuyes y pollos a los que los vende a sus conocidas y amigas. Nuestra socia su primer crédito lo va a invertir comprando pollos y el alimento para sus animales. Su meta es construir su casa propia. ESPOIR uses the village banking method to offer credit and education services to poor and marginalized women in urban and peri-urban areas of Ecuador with elevated poverty levels. The vast majority of its clients did not have access to credit prior to their first ESPOIR loan, and the institution works with clients to help them eventually “graduate” from small group loans to larger individual loans. Kiva funding enables ESPOIR to keep its cost of capital down, creating benefits that can be passed on to clients. For example, one ESPOIR branch office has an on-site health clinic that offers clients and their families unlimited access to medical tests, pre- and post-natal care, birth control counseling, and many other treatments for common ailments for just 75 cents a month per family. Since this service is not profitable for ESPOIR to operate, it would be more expensive to maintain without Kiva funding.